I have been looking for something to put on my wall above my bed for awhile and I found this fantastic site, Dezign with a Z. Using Dezign with a Z wall decals is an easy way to change the look of an entire room. I found the one I put up under the floral section. It is called the Blossun vinyl wall applique. What I liked the best about picking out my wall decal was I could easily see how it would look in different colors, and it also came in 4 different colors, so I could pick the one that worked the best in my space. It was so easy to apply, first I got my boyfriend Rex to help me. Then I sprayed the wall with glass cleaner so that the wall decal would stick properly. 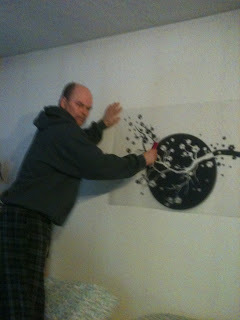 Next we remove the white backing, making sure that the vinyl decal sticks to the transfer tape. We arranged it how we wanted it on the wall and then took the squeegee that was included and rubbed it over the entire decal. Then we removed the transfer tape from one corner and slowly rolled it along the surface pressing down firmly on the decal. When the transfer tape is complete removed we again took the squeegee and rubbed over the decal removing any wrinkles or air bubbles that might have been left. 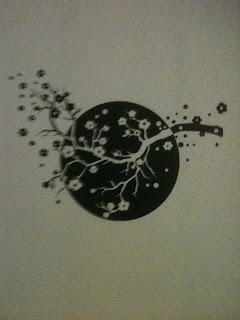 Here is my finished Dezign With a Z wall decal. Doesn’t it look great? It has changed the appearance of my bedroom so much. The wall decal is as easy to remove as it is to put up. If I decide to change the one I have I can either peel off the decal or use a blow drier to heat the decal and it is easy to remove and then start again with a new one. I think you will love Dezign With a Z there is something for everyone, you can change a boring wall into a modern elegant wall with their wall decals in the matter of minutes. The prices are reasonable and it is fun and easy to do.